I was at a party the other day. I know, I can hardly believe it myself! And I was talking to a very lovely couple about what I do (wedding blogger and celebrant) and explaining to them about the whole idea behind personal vows and why couples do them. Their curiosity was so lovely and it was so nice for me to talk to people about what I do AND they seem genuinely interested in it, but I swear at points, they looked at me like, ‘really? People do that? They write their own vows?’ You would have thought I was I was talking about base jumping from the Eiffel Tower, not personal vows. Saying you own vows is THE most awesome thing that you can do during your ceremony. FACT! Photo by Anna Gazda. So I thought I would share with you my answer to their questions. 1) Yes, people really do write their own vows and 2) here’s what they get from it. They are unique. What you say to your love bunny will be completely unique to you (unless you copy it from elsewhere!). They will be your thoughts and feelings, translated in to words. If I could only give one reason for writing your own vows, it would be this! They are personal. What you are saying to each other is from your heart, not anyone else’s. Your vows will not be some generic sentences that sound like they are from a greeting card or ones that make you cringe and gag in equal measure. They will be words that you are comfortable with, words you want to say and words you want to share. It’s fun. 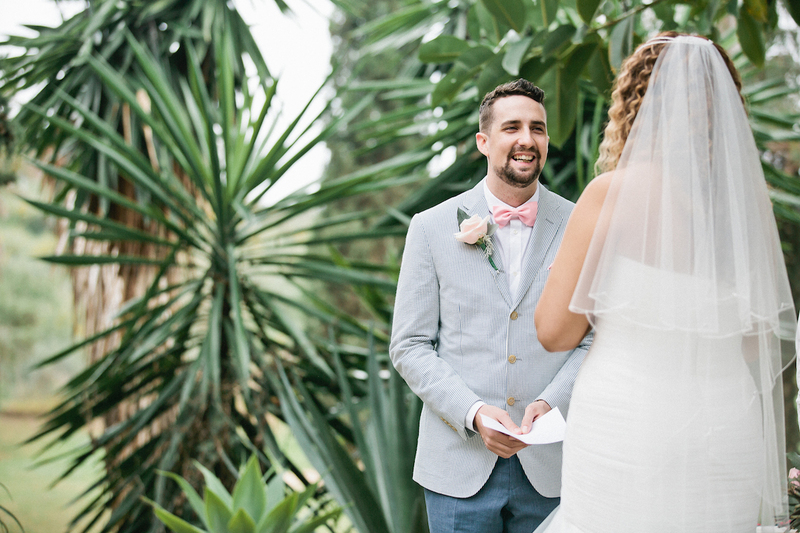 Okay, so it might be a teeny weeny but scary too, but in the moment that you say your vows you will be filled with so much happiness and excitement in getting to say what you really feel, that you’ll forget that you almost were going to pee yourself. You will also find the experience from writing them, to eventually saying them, to be so much fun, especially when you throw in some funny tidbits about you or your love bunny, too. It’s cathartic. I don’t know about you, but expressing myself with written words makes me feel so good. It’s so therapeutic. And I think it is the same with vows, too. I know so many couples who got to see things with fresh eyes when they sat down to write their vows and got to really think about the reasons why they loved their love bunny. Even remembering things they had forgotten or pushed aside. We don’t do this enough people! I just sat here for a moment and thought about why I love my husband and now I’ve got tears in my eyes and want to give him the biggest hug, but he’s not here! So, re-living all of those feelings/moments through your vows, how can that not be good for you? It’s romantic. Even the least romantic person in the world, has got to admit that writing something as lovely as personal vows is a pretty damned romantic thing to do. The good thing is, the act of saying your vows is what is romantic, even if the content itself is not. So this means you don’t need to be mushy and cheesy and romantic if you’re not, because the fact that you are saying anything at all is romantic itself! And If you’re not romantic, then writing your vows could buy you a lot of romance credits for the future! Just remember that! It’s inspiring. In writing your own vows, it’s almost like you are writing your own form of personal constitution. It’s like you are stating to yourself, to your love bunny and to the world, all of the things that you want for each other, all the things you want for your relationship and how you intend to carry those things out. 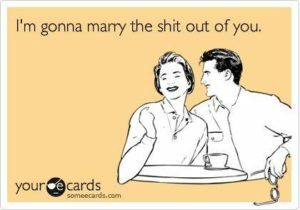 And that I think is a wonderful way to inspire you into starting your marriage off in the best way possible. It’s life changing. Couples who say their own vows to each other get to have a really deep, personal connection during their ceremony, which some say is life-changing and makes them stronger as a couple. I have had couples thank me for encouraging them to write their own vows, because they felt it was one of the most amazing experiences of their lives. It’s special. Honestly, I cannot say this enough. When I talk to couples after their ceremony, like weeks and months afterwards, one of the things that stands out most for them, is the fact that they got to say something personal to each other during their ceremony. Unless, you renew your vows at a later date, it is unlikely that you will make a public declaration of this kind to your love bunny, ever again. So use this moment to truly say what you feel and to proudly declare why you love your love bunny. It’s great for posterity. Lots of my couples keep a wedding scrapbook and print out their vows as a keepsake. Unless you have a recording of your ceremony, it is unlikely that you will remember all that was said and trust me, you will want to keep a copy of your vows. One of my bride’s recently told me that on their first wedding anniversary, which is celebrated with a paper gift, she had their vows printed out onto strong cardboard style poster (Etsy-style!) for her husband. So nice to be able to do this! It’s different. One day I will love that this isn’t on a list like this, because it will be 100% the norm to write your own vows. It will be the same type of thought as wearing a wedding ring, or having a reading. But for now everyone should cherish the feeling that it’s nice to be different.